Be it a new year resolution or a new hobby, everyone wishes at least once in their lifetime to learn and play the guitar! However, many people find it difficult to find time in their busy lifestyles to do so. This is where a guitar learning software will help you! You can have an acoustic guitar learning software free download and learn to play the guitar with ease, at the comfort of your home. 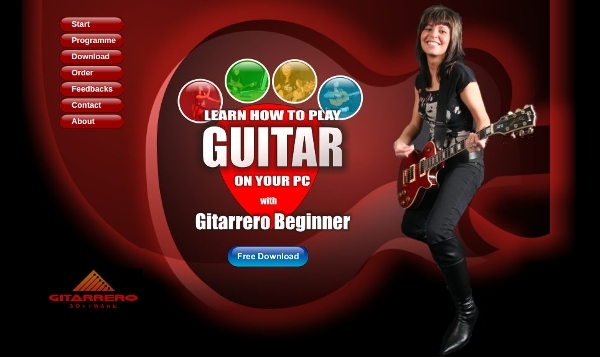 When it comes to choosing guitar learning software for beginners, it cannot get better than Gitarrero Beginner. It offers various lessons & tutorials with a number of exercises. You can also find easy guitar songs for beginners to practice and get your hands on the guitar. Download it and start learning right away. Rock Progidy’s various guitar lessons makes it one of the best software in the market. 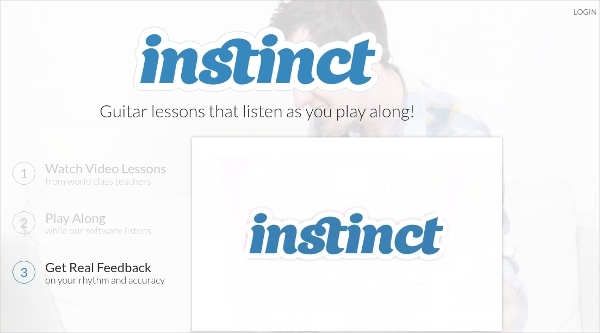 It has a really simple user interface & informative but easy to follow guitar lessons. You also get option to customise various aspects of this app making it easier to use, thus making it more special. Fachords is another software that is people’s favourite. Learning scales becomes really easy with this amazing software. As the website of this software says, you can truly become a guitar ninja once you memorize the frets & practice regularly. Learning guitar becomes really easy using this software. School Guitar is what you should be looking at if you need best guitar learning software for PC. 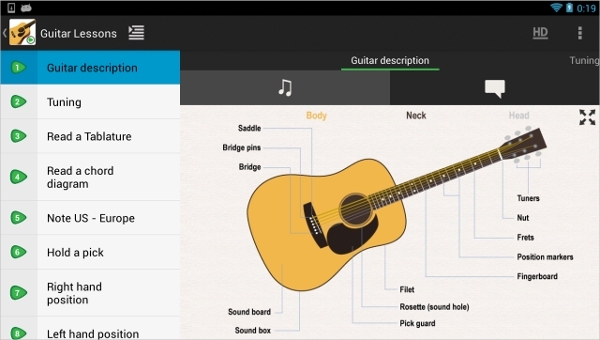 It offers features like tab editor, various fun games for learning guitar, a book full of informative lessons and more. It also includes fun ear training which helps you to identify various chords by only hearing them. You can learn to play guitar leads and chords with ease using this software. Crazy strum is loaded with features like user-friendly interface, easy navigation and chord library. 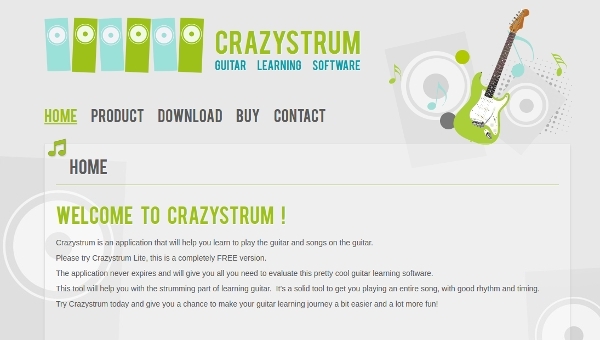 The best thing is that CrazyStrum also offers a Lite version which is perfect if you are looking for free guitar learning software. Instinct is preferred by many people all around the globe. It offers various courses which helps you learn the guitar really fast, provided you keep practicing. There are lessons by many guitar experts which help you throughout your way of the learning phase. Going for Instinct will turn out to be your best decision. When it comes to searching for professional guitar lessons, you are sure to hear one name – Learn & Master. Learn & Master is packed with 20 different DVD’s, all packed with video lessons that are professionally filmed. It also includes 5 Jam-Along CD’s to help you practice & learn more. Jamorama is a perfect solution when you want to learn guitar online free. There are various stages that you can practice on and advance as and when you are comfortable. You can learn at your own phase using Jamorama. You can also learn various workouts to train your fingers to play smoothly on frets. 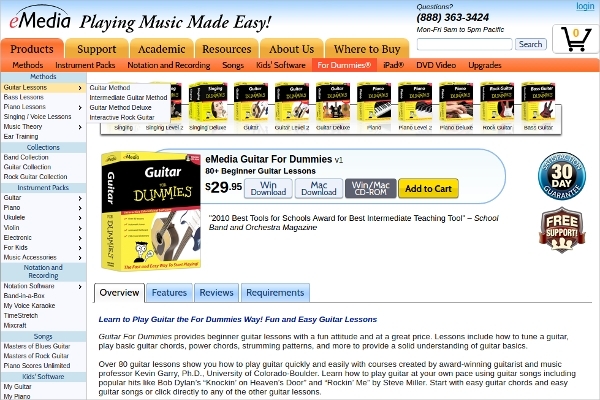 eMedia Guitar for Dummies offers out of the box ideas to help you learn guitar easily. It is loaded with an animated fretboard which has various fingerings & easy to learn guitar songs. If you are looking for best guitar learning software for Mac, download this software right away! 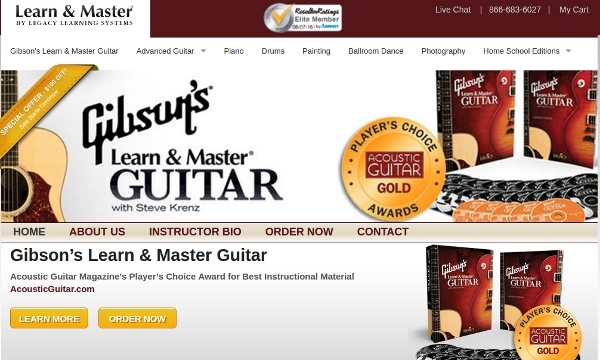 What is Guitar Learning Software? Playing guitar is a dream of many individuals. However, not everyone can live this dream because of their busy schedules. But if you are determined to achieve this goal and put in some extra efforts, a guitar learning software for PC will help you do so! Through this software, you can learn guitar basics. Some professional software also provides with advanced training once you are through with the basics. This software may also provide you with theoretical materials, thus enhancing your knowledge about guitars. It is also to be noted that downloading this software alone will not do the work; one needs to work hard! As, in the end, practicing is what will help you get familiar with all the guitar components like frets, leads, chords, etc. If there is a perfect blend of this software and your efforts, skill of playing the guitar can be acquired within no time. How to install Guitar Learning Software? If you are determined to learn to play the guitar then next step you need to do is download this software. You may visit the website of the best guitar learning software you choose and download the installation file. Then, opening the file and following the instructions on the screen will end the installation process. Double click the shortcut of the software created on your desktop, and you will see the software in action. It might take you some time to get familiar with the interface, but hang on to it, you will start understanding everything slowly. Finally, complete the lessons and keep practicing to master the skill. Say you want to learn guitar but have no time to attend classes to take lessons. Or, you simply want to experiment on learning guitar to discover if you have an interest in the same, before joining any tuitions. What can you do next? Go ahead and download a guitar learning software free download, full version. Benefits of this software are enormous. Ultimate one is that you can learn guitar anywhere you want to! Some say you can’t learn enough with this software, but trust me, if you are ready to put extra efforts, what you can achieve with the tools and features provided in it is limited only by your imagination. Some software also provides you with features such as guitar tuner, chord identifiers, etc. These features add extra benefit to this software is making them a perfect choice So don’t waste any time and get your guitar learning software today! 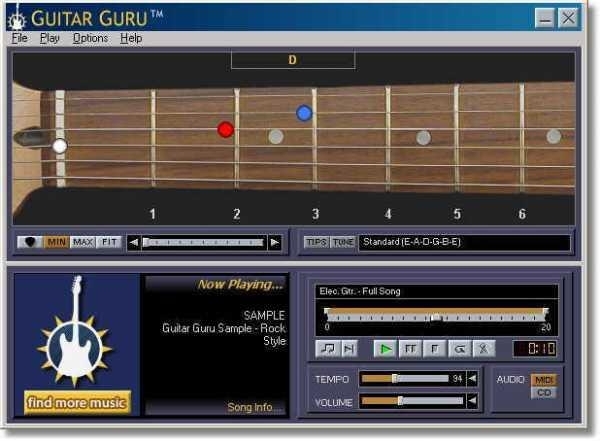 If you want to download best free guitar learning software, Guitar Guru is what you must be looking at. It helps you on every step of your guitar learning journey. With easy to follow lessons and other features & tools, the pace of learning guitar becomes really good. 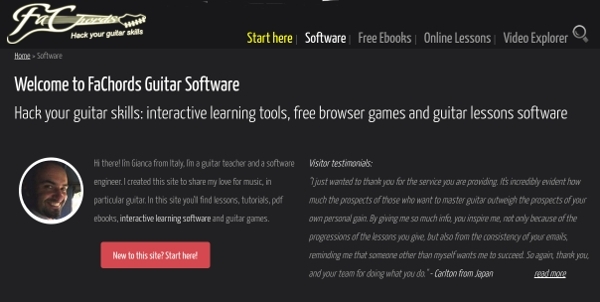 Guitar Lessons Beginners LITE is a free software for learning guitar. There are some lessons that you can take by watching the videos through this software. The best part is that you do not need any prior knowledge of music to start learning guitar using this free software. 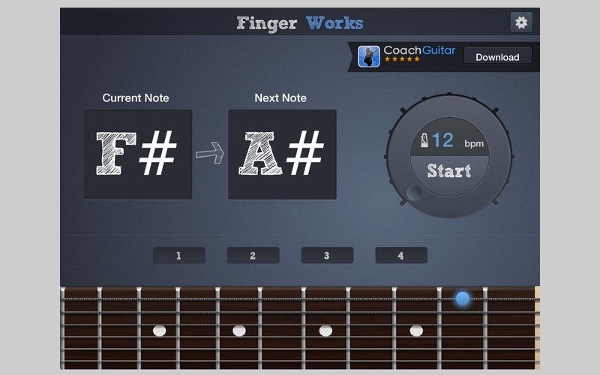 Finger Works is what you can download for free on you Mac OS to start learning guitar at your home. It has multiple options including features that help you to memorize every note on the fretboard. You can also adjust the time limit for various exercises on this software. If you did not find the right app for you in this article, no need to worry. There are a lot of other options available out there to choose from. Some of this software include Metronomo, Capo, iRehearse, Tune & Basic Guitar lessons. A little research will land you on the perfect software. Most Popular guitar learning software for 2016 is Guitar Lessons Beginners, without any doubt. This software has more than one million downloads on Google Play store helping it to reach the top. Positive reviews of this app by its users makes this app a trustworthy and reliable app when it comes to learning guitar.